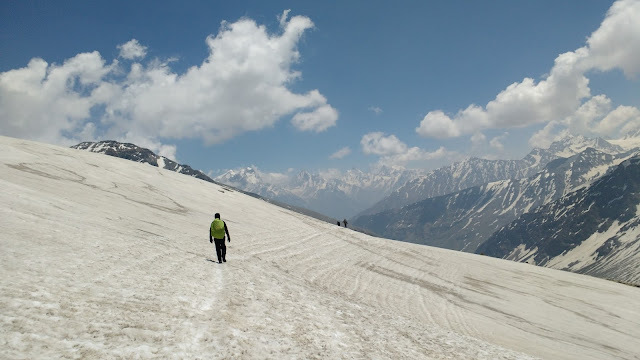 As is considered usual and not addictive in any way nowadays, cameras and cell phones reappeared like old habits from our respective pockets and bags as we celebrated our maiden Rupin Pass summit climb. This was the first ever Rupin Pass batch that the organizers and trek leaders had accompanied to the top, it was a proud moment for them as well. For once, too many photographs were justified. It had been an enthralling, tough climb to the summit. 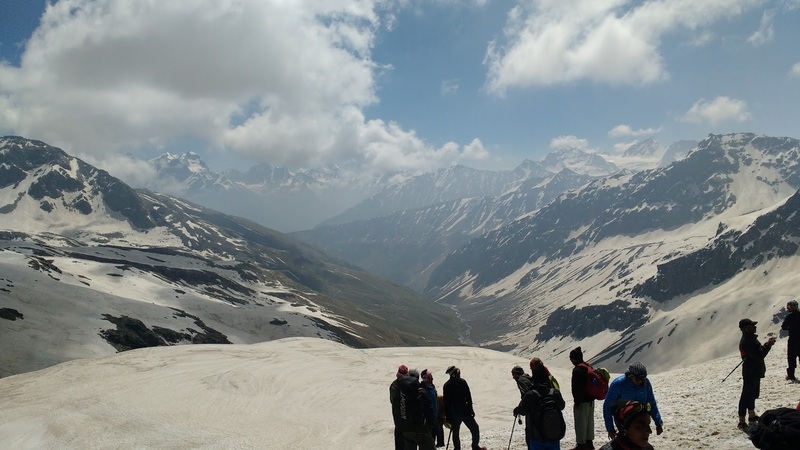 The Rupin Pass Trek has no base camp. So you don't return by the same route. One descends down the other side of the Pass over another two days to the village of Sangla. So the trek was far from over, though the prime challenge was done. There were more new sights, terrain, and experiences awaiting us. Rupin Pass Descent: Lie Down and Slide! The fun began right at the summit slope. Each one of us had to descend the first 150-200 meters by lying on our back, raising our arms, keeping the legs straight on the snow and just letting go! I went down as the second or third person sliding, realizing that doing it now would mean less friction, more speed, and undeniable thrill. It proved to be true. The tenth and eleventh person came down the same slope considerably slower. The porters, as we astonished onlookers discovered with much glee, knew a way to tackle this mitigating factor by coming down fast and tumbling, riding single or double over large thick polythene sheets, used to cover their tents. The sensation of your body flat on the ground, speeding like a comet is one of the greatest pleasures you can have with snow. So off we went down a couple more brief but breathtaking snow slides, tracing our way to Ronti Gad, our next camp at 13000 ft.